CBS Sports is doing some major juggling and flying around this weekend as they have a plate full of college games on Friday and Saturday. On Friday, Nov 23, Arkansas takes on No. 1-ranked LSU on Friday, Nov. 23 (2:30-6 p.m., ET). On Saturday, Nov 24, No. 19-ranked Tennessee battles for spot in SEC Championship vs. Kentucky and Florida State visits No. 12-ranked Florida on Saturday, Nov. 24 (1:30-8 p.m., ET). Verne Lundquist, Gary Danielson and Tracy Wolfson, CBS Sports' lead college football announce team works double-duty this weekend. Friday, they handle the call for Arkansas-LSU from Tiger Stadium in Baton Rouge, LA. No. 1-ranked LSU hosting Arkansas highlights Friday's coverage, as LSU looks to defeat their Western Division foe and remain in the hunt for the national championship. 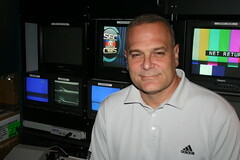 Craig Silver (pictured above), the Network's coordinating producer of college football, produces and Jim Cornell directs. 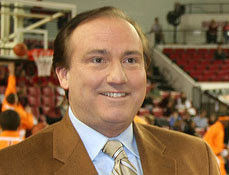 Saturday's doubleheader features a national broadcast of No. 19-ranked Tennessee taking on Kentucky (1:30 p.m., ET). A Tennessee win secures a spot in the SEC Championship game. Craig Bolerjack and Steve Beuerlein call the action for the Tennessee-Kentucky contest from Commonwealth Stadium in Lexington, KY. Steve Scheer produces and Mark Grant directs. In the second game, Florida State visits intra-state rival and No. 12-ranked Florida (5 p.m., ET). On Saturday, Lundquist, Danielson and Wolfson (pictured right) call the action for Florida State-Florida from Ben Hill Griffin Stadium, in Gainesville, Fla. Steve Karasik produces and Steve Milton directs. Legendary Ole Miss quarterback Archie Manning joins host Tim Brando and analyst Spencer Tillman on "College Football Today," the Network's pre-game, halftime and post-game studio show on both Friday and Saturday. 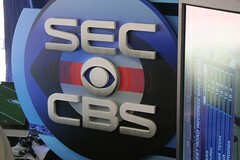 "College Football Today," kicks off the day on Saturday (1 p.m., ET). Vin DeVito produces and Linda Malino directs. All three games also will be broadcast in HDTV. Photographs Copyright 2007 by Christopher Byrne, All Rights Reserved.